https://o.rths.cf/palemoon/?sort=date&amp;order=desc BOC related binaries: Binary list: https://o.rths.cf/boc-uxp/?sort=date&amp;order=desc FAQ: Q: Having audio distorted when watching Twitter/etc.? A: Please try turning on "Firefox compatibility" in options dialog or either "general.useragent.compatMode = 2" or "general.useragent.compatMode.firefox = true" in about:config and reload the page. A: Download following packages for your browser edition(32bit/64bit) and extract DLLs to same place as palemoon.exe lives. 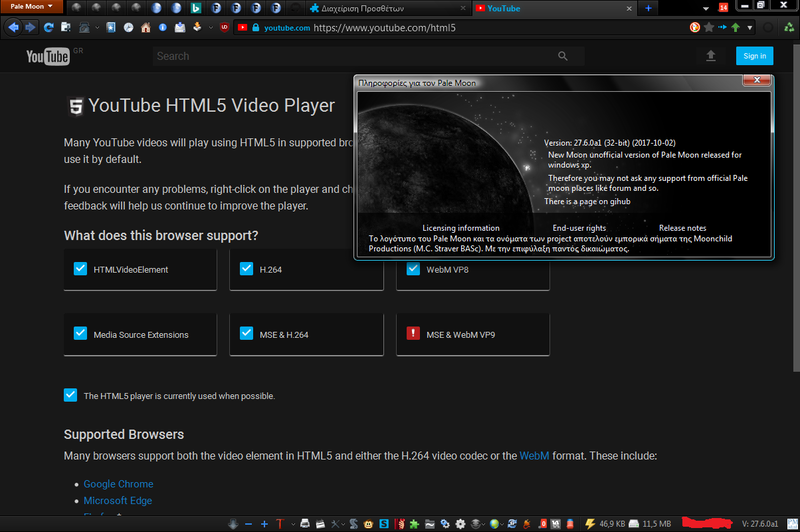 A: VP9 works if async MSE option is unchecked and "Enable MSE for WebM Video" checked in options. Q: Extensions/Themes not working after updating binaries. 1.e Drop XPI files from the copied-out extensions folder to about:addonss page One-by-One. 1.f After all XPI files are dropped and installed/updated, restart browser Q: Virus detected? A: Tell your anti-virus program to exclude palemoon.exe and/or plugin-container.exe. Some anti-virus heuristic engines (for example symantec's sonar engine) is too sensitive to palemoon.exe/plugin-container.exe network activities. Q: Where's your patches for compiling my own? A: Please visit the link above "FAQ:". Latest source patch files are named "sources_patches_YYYYMMDD.7z" in that page. Q: basilisk browser showing basic pages in GMail? general.useragent.compatMode.gecko Q: How to change User Interface language? A: Please see this post: Q: Portable Loader? A: You can always use official portable launcher with my binaries, or you can use my simple portable loader written in NSIS: Q: How to install extensions/themes in BNavigator browser? It has its own sub-forum in K-Meleon official forum! ----original post message belows---- Today's build with portable LAV libraries. -Enable Brotli content-encoding by default (https only).